The Warrington Wolves haven't won Rugby League's top prize since 1955 so Matthew Crist asks if can they end one of the longest waits in sport when they face the Wigan Warriors in Manchester this weekend. "Going in to this season’s play-offs there was little talk about Warrington with most of the focus on the battle between St Helens, Wigan and Castleford, probably understandable seeing as The Wire have not claimed Rugby League’s biggest prize since way back in 1955." It's one of the longest running jokes in Super League but after 63 years of hurt this might just be Warrington's year as they prepare to face Wigan Warriors in the sports' showpiece event at Old Trafford on Saturday night. Going into this season's play-offs there was little talk about The Wolves with most of the focus on the battle between St Helens, Wigan and Castleford, probably understandable seeing as The Wire have not claimed Rugby League's biggest prize since way back in 1955. 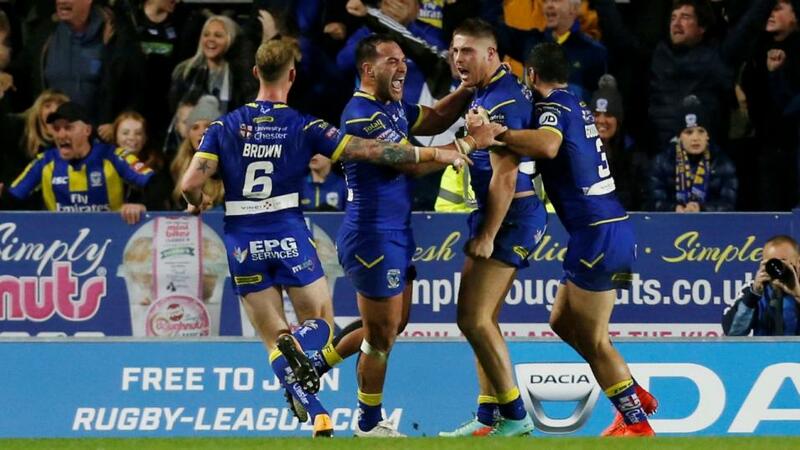 To say Warrington, who finished the regular season in fourth place, had been written off before the last four stage would be unfair but they certainly flew under the radar as most of the media attention was on the three sides who finished above them. But this may actually have worked in their favour as they look to end their long quest for league glory and are currently priced at [2.58] to win the Grand Final. When Warrington run out at Old Trafford on Saturday night it will be their second final of the season having been beaten 20-14 by the Catalans Dragons in the Challenge Cup at Wembley in August and Coach Steve Price hopes that his side will have learned from that bitter experience. "For a couple of weeks after Wembley, we weren't sure how the season would go," Steve Price said ahead of the club's semi-final with the Saints. "We delivered some home truths because as a group, we were disappointed. We spoke all week about needing all 17 players to contribute their best game of the season and they certainly did that. A stunning performance in their 18-13 win over St Helens would suggest that Price's men have put that desperate disappointment behind them as his side looked inspired at the Totally Wicked Stadium thanks to two tries from Tom Lineham and a pair of Danny Richardson drop goals. However, having been on the losing side in three of the last six finals Warrington will be wary of their opponents who last lifted the Super League Grand Final trophy two years ago and at [1.65] are favourites to do so again. With the weight of history weighing heavy on the Wolves Wigan shouldn't be overlooked as they look to win the Grand Final for the third time in six years and will surely be inspired by the fact that the match will be coach Shaun Wane's final game with the Warriors as well as departing players Sam Tomkins, John Bateman and Ryan Sutton. Wane will leave the club after six years in charge following the Grand Final in Manchester and has already admitted that he got emotional in his last game at the DW Stadium. "It would mean absolutely everything if I could finish off with a win in the Grand Final," he said following his side's 14-0 semi-final win over Castleford Tigers. "I don't cry very often but I did out there. It was emotional and it has been a very tough last few weeks. I've driven out of Old Trafford as a winner and a loser and there is only one way to go out on that coach and that is why we didn't celebrate much tonight. It is all about next week." Saturday's Super League Grand Final is a repeat of the 2016 finale which saw the Warriors run-out 12-6 victors in a tight encounter but just getting to domestic Rugby League's biggest game won't be enough for Warrington as they look to finally bring an end to their long wait for Super League success.